Apiary Harvest Labourers and Apiary Harvest workers required for seasonal work in a commercial honey production and bee rearing operation for the 2019 season. Three Apiary Harvest Labourer positions available for 5-7 months (starting no earlier than February). Labourers perform (but are not limited to) tasks such as supering hives, harvesting honey, cleaning honey extraction and storage equipment; barrel filling and moving; repair, assemble and maintain hive equipment and bee equipment; bee yard maintenance. Knowledge of the industry, a valid drivers licence and English speaking skills an asset but not mandatory. Wage starts at $11.10/hr with subsidized housing option, transportation and potential for bonuses based on performance, attitude and character. Three Apiary Harvest worker positions available for up to 8.5 months (Feb to November). Apiary Harvest Workers perform (but are not limited to) tasks such as supering hives, harvesting honey, cleaning honey extraction and storage equipment; barrel filling and moving; repair, assemble and maintain hive equipment and bee equipment; bee yard maintenance; assist with colony manipulation; assist with colony treatments; assist with moving colonies; assist with feeding colonies. 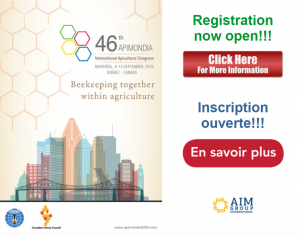 Canadian beekeeping industry knowledge, 1 year experience, valid drivers licence and English skills required. Wage starts at $12.15/hr+ with subsidized housing option, transportation and potential for bonuses based on performance, attitude and character.